This week’s blog is by Dr Errietta Bissa, a Senior Lecturer in Ancient History at UWTSD Lampeter. 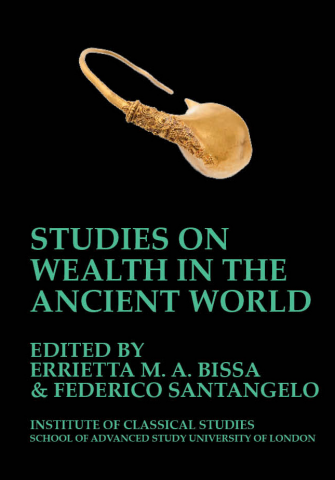 Dr Bissa has recently edited a book on ancient economics; below she explores the roles of monopolies in the ancient world. When thinking about the ancient world, the question of state intervention in the economy is not something that we normally consider. Often enough, looking into the economy of ancient societies is considered either arcane or futile. Certainly, it can be a challenging process, with its own moments of struggle and dullness. Yet, it can offer us so much to better understand both how the ancient world worked, and how the ancients themselves understood their own society and relations with other states and peoples. Considering monopolies, particularly in classical Greece, is definitely a niche subject. It is indeed rather rare to even find the word monopoly in any book about ancient Greece, or even the Greek economy. A more careful look though reveals a wealth of information, even if the sources on monopolies are scant. The common view in scholarship for almost a century has been that monopolies were rare and emergency measures that the Greeks seldomly employed, and when they did, it was to alleviate a specific problem or famine. Yet scholarship has been deceived by the gross accident of survival, and specifically of one ancient work. Sometime in the late fourth century BCE in Athens, one of Aristotle’s students (we don’t know who) compiled a book – it is called Oeconomica. It was probably no more than a preparatory compilation for one of Aristotle’s works – almost like an assignment given by a professor. The aim of the compilation was to provide examples of how states and rulers could get out of financial or economic problems, so that future leaders had a bank of ideas to be inspired by. Unsurprisingly a number of examples include the imposition of a monopoly on one commodity or another. What we see here are not rare or emergency measures – indeed these are economic policies relating to products that were very important. These products – timber for warships, miltos, a type of rare earth mineral, and siplhium, a herb that was supposed to cure many diseases – were not only essential to the economy of their producing areas and poleis, but also were primary export products. In these cases, instituting a monopoly meant that the state had a clear revenue stream. This was very important in the Greek world, as there were no direct taxes in the Greek polis. A Greek state, unlike a modern state that has recourse to both income taxes and corporate taxes, could only impose indirect taxes, i.e. taxes on trade. The imposition of direct taxes was considered an infringement on the rights of the citizens. Hence, for a state to sustain its treasury, it needed to control trade, and trade items. Few measures were as powerful as a monopoly, and that is what several states did, as per the records that survive. Many other states also made certain that they were the ultimate owners of their “special” resources, like Athens did with her silver mines, which belonged to the state and were leased to private contractors. What I find more interesting is that we primarily come across these types of monopoly relating to resources that needed to be husbanded. The obvious case is timber, but also silphium. A monopolic arrangement, not only of trade, but also of production rights, meant that the state could make sure that exploitation rates were such that the resource was not overexploited.